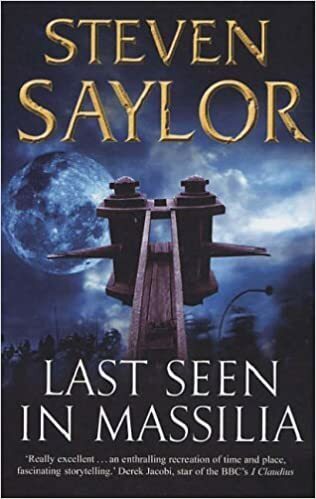 Last Seen in Massilia is the eighth book in Steven Saylor’s series of books Roma Sub Rosa, historical crime fiction set in ancient Rome, featuring an investigator called Gordianus the Finder. I’ve begun the series with this book, rather than with the first book, because it was in a pack of books I bought earlier this year from Barter Books. This one is not set in Rome, but in Massilia – modern day Marseilles. It’s 49BC during Caesar’s siege of the city. I liked it for it’s physical and historical setting but I think the crime element is secondary. It begins as Gordianus is on his way to Massilia to look for his adopted son, Meto, who has been reported dead. Massilia is surrounded, access extremely difficult, if not impossible and Gordianus and his son-in-law Davus join the Roman troops attempting to enter the city through a tunnel taking them underneath the city walls. An attempt that ends almost in disaster as the tunnel is flooded and they are almost drowned. Fortunately they are rescued by Heironymous, the elected scapegoat doomed to take on the sins of the people by throwing himself off the Sacrifice Rock. Whilst he is unable to find out what has happened to Meto, he and Davus witness the fall of a young woman from the Sacrifice Rock. The question is was it suicide, did she just slip or was she pushed. All this is going on, although Gordianus doesn’t actually do much detective work, whilst the siege of the city comes to a fiery and dramatic end. What I really liked was all the detail about Massilia – how it was governed – the hierarchy of theTimouchoi its ruling officials, its relationship to Rome, its traditions and customs. So it’s no surprise to me that Saylor has used the available sources for his book – Aristotle, Cicero, Strabo and Plutarch. For the details of the siege he used Caesar’s The Civil War, amongst other primary sources. Reading challenges – Historical Fiction and What’s in a Name, category a book with a city in its title. Obviously, I haven’t reached this book yet but it sounds as interesting as the two I have read. I’m thoroughly enjoying my foray into Ancient Rome as it was a subject I didn’t know a great deal about. I love discovering a new literary interest. What an interesting setting, Margaret! And I always like it when the author can depict a place effectively, so that you learn a lot about it. Glad you thought this one was worth the read. I haven’t even heard of this series, more shame to me, although I loved Lindsey Davis’ Falco series. Is this one as tongue-in-cheek and funny? I haven’t read any of Lindsey Davis’ books!! I wouldn’t say Last Seen in Massilia is tongue-in-cheek or funny. Just perfect for my reading interests these days, though I will most likely start with the first in the series. I like that the author has gone to Roman sources. Next Next post: Challenge Completed – What’s In a Name?